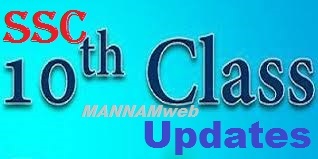 Sub: SSC Public Examination March 2019 - updating of student data in SSC NR hosted on www.bseap.org - Editing the data as per the Admission Register - Orientation Programme to all HMs and all the concerned at district level- Orders issued - Regarding. The SSC Student data that is available in the child info is hosted on the website www.bseap.org from 20-11-2018 and it will be closed on 30-11-2018. 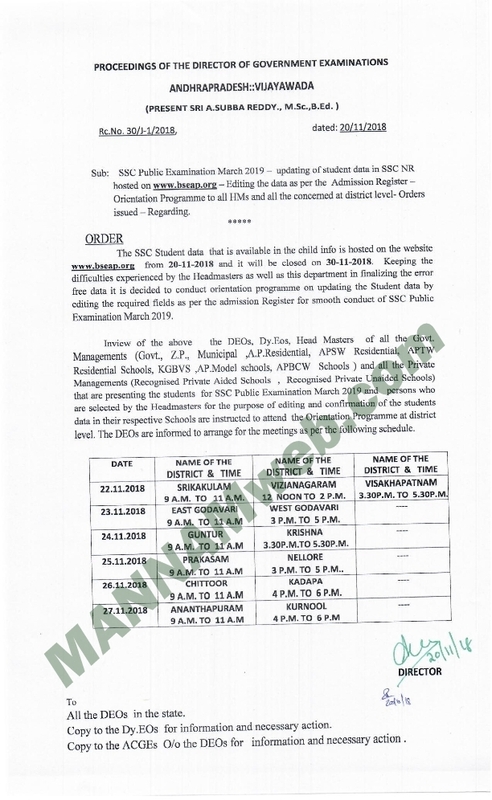 Keeping the difficulties experienced by the Headmasters as well as this department in finalizing the error free data it is decided to conduct orientation programme on updating the Student data by editing the required fields as per the admission Register for smooth conduct of SSC Public Examination March 2019.
level. The DEOs are informed to arrange for the meetings as per the following schedule. Please mail me the progs model for sanction of allowance for dealing higher classes in zp high schoolfor lang.pandits.